I picked up this book partly out of the noble and sincere desire to learn how to make a great marriage, but mostly because I wanted to read about other people's problems and how they handle them. I don't like self-help books, which are usually both textbook-ish and too chipper. But a nonfiction book that follows real marriages over time, documenting their issues in brutal detail, and maybe offering insights into strategies that help some marriages last? Oh yes! But that's not what this book was. 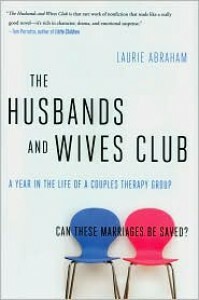 It did follow several couples in therapy, but the goal seemed to be to examine the practice of and theory behind group marriage therapy, rather than to learn more about marriages. Abraham spent lots of text discussing the therapist, Coché, and her techniques, as well as the history of the psychology of relationship dynamics and therapy practice. To me, this part seemed to enlighten people on how to be better therapists, not better spouses, and it was very dry. The structure of the book also made it difficult to read. Despite the introduction of each of the five couples at the beginning, I quickly forgot which person was which and who was married to whom. I'm not sure that following all five couples simultaneously and chasing down the history and theory behind the therapy at the same time was the best choice for this book. Theoretically, the couples should be interacting and influencing each other, but I didn't really see that happening in the book. So from a reader's perspective, I think it would have been easier and more satisfying to follow each couple individually, one chapter at a time. If Abraham still wanted to cover some point of theory or history, she could have picked one idea that was illustrated by each couple and explored it through their particular issue. Honestly, though, I think she was prevented from presenting a better structure in this book by Coché, who doesn't come across as having much of a long-term plan behind her actions. I wanted to stay with it, but after about a third of the book I still didn't know who was who and I just really didn't care about them yet. Even though hints had been dropped along the way that at least one couple was headed for separation, there wasn't any tension from page to page. I was very disappointed. Not recommended.